Illuminated dots are positioned at the intersection of each of the duplex crosshairs. In the field, you select non-illuminated black dots or 1 of 2 illuminated colored dots (red or green). These are controlled by a five-position rheostat so you can match the illumination intensity to your hunting conditions. - 20, 30 and 40-yard combo crosshair and illuminated dot configuration, with a free-floating dot for 50 yds. 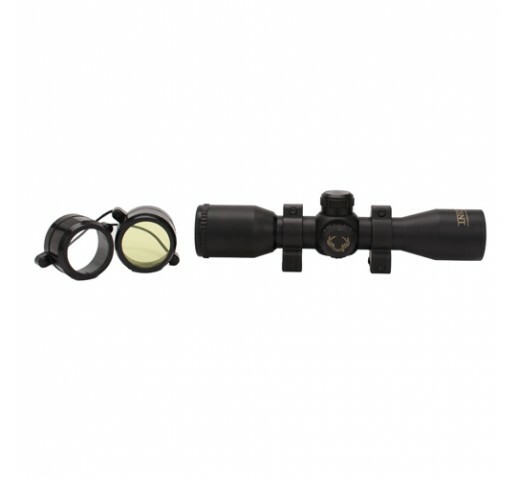 0 Housed in a lightweight 8 1/2" aluminum tube equipped with fully-coated 3x optics.